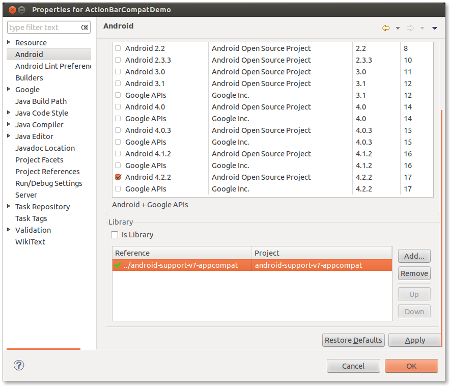 We know that, action bar is implemented in Android 3.0 ( Honeycomb or API Level 11) on wards. 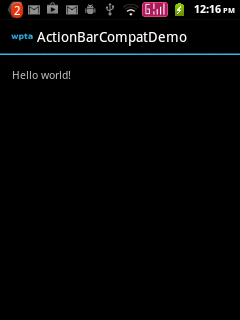 But we can implement action bar in pre Honycomb versions upto API Level 7 using ActionBarCompat library available with Android support library revision 18. In this article, we will see how to implement action bar in pre honeycomb versions using ActionBarCompat support library. Note : As shown in the highlighted line7, the activity should extend the class ActionBarActivity. hi in manifest file Theme.Appcompat not exits? It is already there in the article as well as in the attached source code. Hi, I have downloaded and ran this app, all works fine. Then I added this line after setContentView(), getSupportActionBar().setTitle(“Title”); but it throws me NullPointerException. why? can we use this method for min sdk 7 ?